BrainSkip 9 – Snow BrainSkip, Snow Way! One of the most peaceful times on earth is when the snow falls (except in North Korea, there is no word for peacetime in North Korea, there is only bombing the crap out of everyone, and waiting to bomb the crap out of everyone). It slows everybody down. Strangers talk to each other on the street to make sure they’re ok, which allows the creepy and more deranged people in society fit in for just a little while, feigning concern for the slippery snow, while at the same time suggesting to passers-by that it’s an alien conspiracy. In a surprising development this week, Ireland estimated there would be 5cm of snow while temperatures would reach -10degrees. In typical Irish fashion, we were wildly wrong as to estimating how bad it would actually get and have been covered in 5 metres of snow, while temperatures have plummeted to -17Degrees. Apparently the weather forecast was prepared by the department of finance. 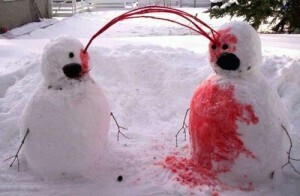 Everyone likes to have fun in the Snow, but sometimes, it goes very very wrong!!! He pulls a knife, you pull a gun. He puts one of yours in the hospital, you put one of his in the morgue. 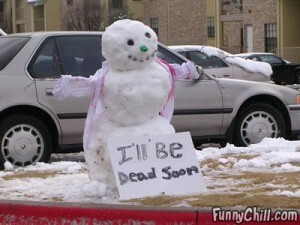 He throws a snowball. You pull a gun!!!! You pull a gun!!!! Are you kidding!!!! Welcome to Snowball Fight Washington D.C. Style!!!! Many countries have been used to snow for years and have adapted accordingly. Some even enjoy sports on ice and snow, such as tobogganing, ski-ing and curdling grannies, oh no, that’s curling, Grannies! For some of us who have the natural balance of a drunken Sparrow, ( and I don’t know if you’ve ever seen a drunk sparrow, but it has no balance. Getting a sparrow drunk in the first place is almost as hard as skiing), we can appreciate the pain that these people went through. 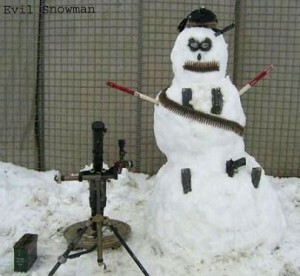 Apparently the Real IRA have refused to let the inclement weather get in the way of their plans for the holiday season. The Day After Tomorrow, made the world look like it had been taken over by a Giant Coors Lite Commerical, where every inch was covered in some sort of glassy frost. For those of you who can’t stand the several hours of shivering while watching it, here’s the movie summed up in 5 seconds. This is a famous clip of a couple who refused to listen to anyone when told it was too icy and snowy to drive. And this is what happens!!! A humble Snowman, who understands he’s only around for a short while to do nothing other than bring a smile to our face until disappearing completely. Let’s hope the IMF take a leaf out of his book.